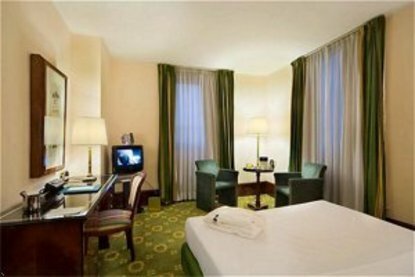 Una Hotel Scandinavia is a modern and well appointed establishment offering high level of comfort and service. Its pleasant location avoids many of the traffic problems associated with other parts of Milan. The beautiful Italian marble and mahogany interiors of the hotel provide an atmosphere of elegance matched by the warmth of the welcome you receive from our multilingual staff. The 153 rooms and suites are tastefully decorated in modern classical style. They are located on 6 floors, each with its own individual colour scheme, shoe shine and ice machine. All rooms are equipped with telephone, voice mail, radio, satellite tv, pay tv movies, minibar, hairdyrer, safe, modem and computer hook-up. We have rooms specially designed for disabled guests, non smoking rooms, 62 executive rooms, 2 junior suites and 1 imperial suite with even greater levels of comfort and space.